Is our world about to end? I must draw, urge it to mend. I’d never come across Chrissie Gittins’ work before. Her pamphlet, Professor Hedger’s Daughter, introduces her as a quite prolific writer of adult and children’s poetry, as well as a short story writer and radio playwright. What a find she is! 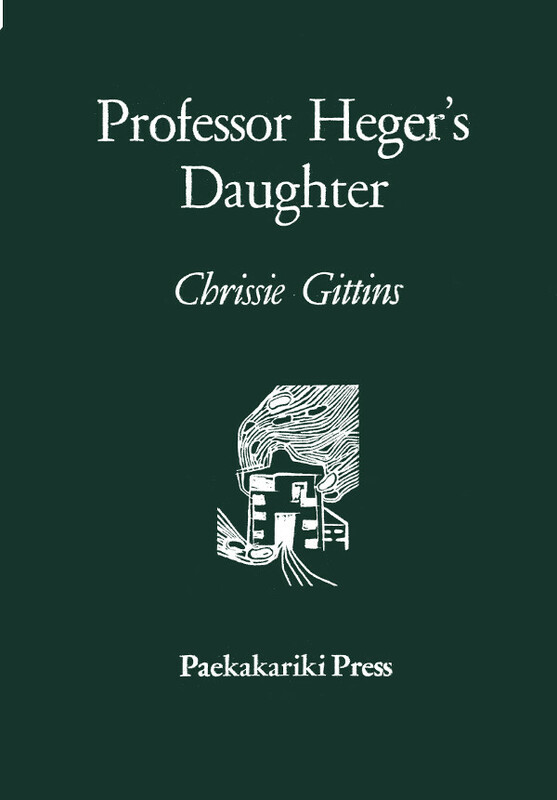 Professor Heger’s Daughter is one of the finest pamphlets I’ve read in recent years, for its range of ideas, its emotional sensitivity, its great wit and humour, and – more than anything else – its deranged use of language. I mean that sincerely; this is a writer who isn’t resting on linguistic laurels, her words pop out of the page in a “what just happened” way that makes me want to soak it up and then revisit it over and over again. Are you by the floral teacups, beside the plate of scones? Or in the yeast which lifts your father’s bread? or in the brush which coaxed your peat brown hair. There’s a clear reference here to Mary Elizabeth Frye’s 1930s poem, ‘Do Not Stand At My Grave and Weep’ (“I am a thousand winds that blow. / I am the diamond glints on snow.”) but I find this altogether more successful in some ways, more personal through its homely approach and use of specific details. A number of the poems become reflections on the presentation of memory, or the past, and the artistic imperative, or perhaps (in)ability to capture it. This offers a counterpoint to the art work in the book, prints from wooden engravings by Helen Porter. These are fine visual nuggets to digest, sometimes imagist, sometimes simply abstract. The two art forms combine to raise serious questions about the permanence of our creations and how we might continue to exist after we too are “lost”. and shake a veil of grey through an open window. Is it any wonder he fell back into cake? his box of colours to the ground. I found him weeping in a pool of palest blue. 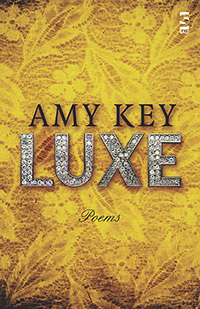 True to its title and glamorous front cover (a matte-gold jacket, diamond-studded text), Luxe is filled with luxuries, both material (vintage fashion, brick-a-brac, trinkets) and immaterial (love, friendship, loss), for holding in the hand or wearing on the body figuratively. Many of these poems catalogue and list objects that represent the poet’s likes, loves, memories and desires. of everything that matters to me, leaving nothing out. Is that what it’s like to be afraid to die? trying to ornamentally tile my life. I describe ‘tulle’ and ‘chiffon’. In which I walk down Lower Marsh with a paper bag of apples. The wind laps at my ankles. I covet the turquoise paisley dress. I relent – as you wish, as you wish. I leave my flat to the sockless beatnik. Poem in which I have sequined ears. This remarkable and beautiful book reveals itself slowly in layerings and inter-weavings much as its language assumes natural forms of bird’s nest and hedgerow. At its heart is the evocation of a friendship between the poet John Clare and Wisdom Smith whose bare title of Gypsy does not do him, or his many skills and powers justice enough. ‘The Gypsy’ and ‘The Poet’ sequences are separated by a central section, ‘World’s Eye’, which works to re-calibrate focus on the main theme, rather as a birdwatcher might adjust his binoculars to look differently from new angles and distances. Through birds and birdsong the poet asks unexpected things of language in ways reminiscent of GM Hopkins. One extremely lovely poem, ‘Pallid Swift’, will never leave me. The core of the collection is the charting of the relationship between poet and Gypsy as a powerful, difficult, loving friendship between two different creativities, not just between Clare’s sensitive, insecure, diffident spirit and Wisdom’s more robust, down-to-earth shaman but also between two world-views separated through metaphor of language: Wisdom Smith’s Romani which, like birdsong, seems always foreign, even untranslatable, counterpoints Clare’s visionary poetic continuously straining to transform thought into thing itself and vice versa. Though ‘broken’, Wisdom’s emerges the stronger, able to puncture Clare’s more high-faluting Romanticism and see through its ultimately self-destructive desire for fame and recognition. Clare is drawn to the Gypsy way of life it seems because he idealises its freedom: Morley, through Wisdom, is blunt about its unpoetic deprivations and hardships. Wisdom’s language, encompassing his philosophy and identity, is the stronger for being grounded in an older tradition that does not adhere to ephemeral values. Clare is all insecurities: poetic, sexual, social – for example he builds walls and hedges, takes part in the enclosing of the land in order to survive, though he detests himself for doing so. Both are woven tight within the constraints of their lives like wild birds trapped in a net. “John, I know no man no more half-in or half-out of your race” Wisdom tells Clare: though he lives beyond society as an ‘outsider’, Wisdom Smith appears far more secure in his own community than Clare will ever be in his. When they are closest it is at a childlike, visceral, almost pre-verbal level. Both are passionate about the natural world, both are asking profound questions about their places in it and what it means to be alive. Morley charts how the friendship changes through the book, encompassing moments of menace, quarrels, reconciliation, misunderstanding between them and their eventual drift apart. It is a very enclosed, private, singular friendship: other Gypsies, John’s family, his Patron, none impinge directly on the time the two men spend together, talking, eating, working, thinking aloud, arguing. And the shadow of Clare’s oncoming madness darkens the final poems. ‘Poetry is not everything. You know that, John,’ smiles the Gypsy. The more I read this mysterious and beguiling book the more I find in it, most of all the image of the bird’s nest which becomes John Clare’s hat, the brim of which he leaned on when writing poems. it were not the language spoken here. Like a lot of poems in this section, it seems to take a while to ‘warm-up’ and dashes off the most interesting concept in a one or two line conclusion. That the whole island seems to be waving the poet off isn’t as interesting as the idea of him going to a foreign country to do something seemingly foreign: study a common language and literature at university. the steps, his eyes tired from being up. he has a washing machine and dryer to sell. seems an offer to hug, the size of the pain. The final image extends the poem beyond the page, inviting readers in. It’s a finely-judged note of compassion. As with every poem in the collect it sticks to a conversational, easy to read tone in everyday vocabulary. The poet’s intention seems to be to reduce as many potential barriers to reading his poems as possible, ensuring a large, inclusive audience. This risks losing readers who want poetry to challenge or provoke them or to be more difficult to read than a newspaper article. it take me to get mine. 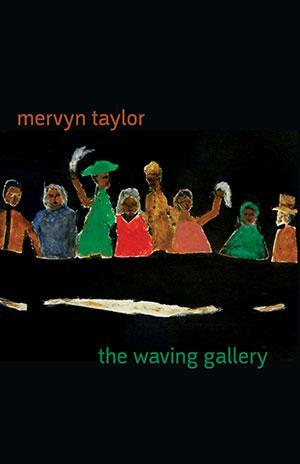 The reference to Libya and Cairo is unusual because most of the poems have a timeless quality and focus on personal interactions and connections with neighbours, commuters or passers-by. ‘Embassy’ captures a strong note of resignation. His counterparts won’t go and fix the bridge or lob grenades but instead accept this is how things are. That reflects these poems too: they are eloquent and welcoming but won’t say anything world-shattering. That’s not the poet’s intention. It’s as though he wants to reassess how things are and ask if readers are comfortable with that.